Egypt will be out to prove that they are more than just a banana skin when they take on Russia in Tuesday’s 2018 FIFA World Cup match in Saint Petersburg. The match — which will mark the beginning of the second round of group stage matches — will perhaps be the most significant, as it will help define the slope of the table; serving as a reality check to others whilst music to the ears of those progressing into the knock out phase. Russia could move a step closer to securing their place in the last 16 with a win over Egypt, following their remarkable 5-0 drubbing of Saudi Arabia in the opening match of the 2018 FIFA World Cup. It was hard to imagine how Sbornaya had gone without a win in their last seven matches prior to the World Cup, as the hosts put up an all rounded performance in front of a packed Luzhniki Stadium. Yuri Gazinsky scored what was his first international goal after heading the ball into the back of the net having been unmarked in acres of space, but it was substitute Denis Cheryshev that made the biggest difference. Despite not being part of the initial plans, the Villarreal fullback was forced off the bench for Alan Dzagoev who sustained what looked like a hamstring injury midway through the first half. Some good yet came of it, as the 27-year old doubled Russia’s lead by thumping the leather at the near post right before the interval. Stanislav Cherchesov’s judgment seemed to be working with unerring accuracy on the day, as another substitute in Artem Dzyuba extended the lead in the 71st minute with a thumping header. Cheryshev doubled his account for the day with a sublime strike in additional time while Aleksandr Golovin- who provided two assists- saved the best for last by scoring a sensational free-kick during the last minute of injury time. With that the hosts had duly delivered, in spite of being berated so much for the sorry state of their FIFA ranking, as it was for their recent poor run of form. The win nonetheless ensured that no host nation has ever lost the opening match in any of the 21 editions of the FIFA World Cup. The assertive victory has Russia leading the charge on group A with three points; albeit on goal difference after Uruguay snatched a last gasp win over Egypt. Both sides looked on course to drawing a blank, which could have secured a vital point for the Pharaohs who were without Mohamed Salah, but their solid defensive display creaked when the South Americans scored a set-piece goal in the 89th minute. Luis Suarez and Edinson Cavani had missed cataclysmic chances throughout the match, which had the Egyptians believing they could share the spoils given their chances were few and far between, but Jose Gimenez met Carlos Sanchez’s free-kick to dispel all doubts over assignment of the points. 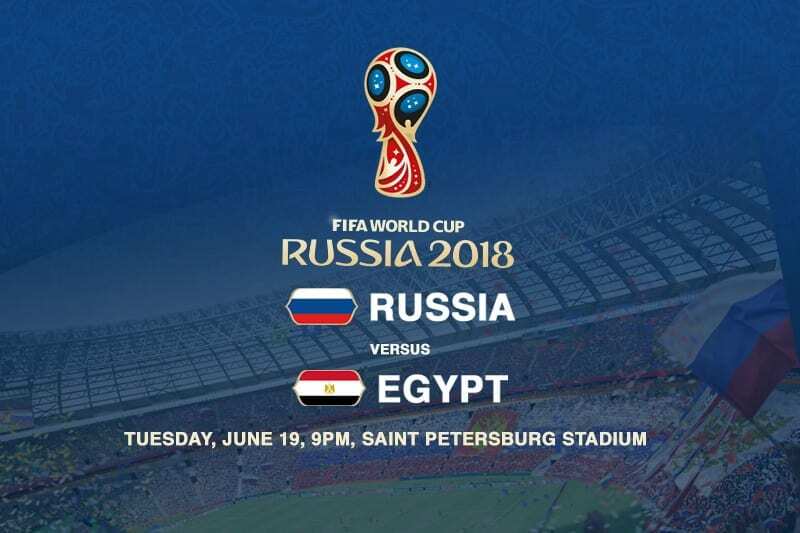 As such, Egypt now have the unenviable task of stopping Russia in their tracks; a tall order in its own right seeing as Sbornaya are in high spirits, on top of commanding a partisan majority of the twelfth man as the hosts. Stanislav Cherchesov looks set to maintain the side that breezed past Saudi Arabia on Thursday, but it is Egypt’s change that may very well define the course of their World Cup campaign. Mohamed Salah — who watched helplessly from the dugout as Egypt’s grip on Uruguay loosened — will have the chance to make his impact, as he looks certain to start against Russia. The appearance against Russia will be his first since sustaining a shoulder injury during Liverpool’s 3-1 defeat to Real Madrid in the Champions League final on May 26th. If it wasn’t as obvious from the opening match that Egypt’s attack in centered around Mohamed Salah’s astute agility, then it will become increasingly so when he is hauled back into the starting eleven against Russia. Although his mere presence will give the Pharaohs a face lift, the Liverpool forward is a bit short on match practice and may need some time to settle in and regain his cutting edge touch. Egypt are exasperated having emerged from their first match without a point, and will certainly fight for dear life, but Russia look the leaner, meaner side.